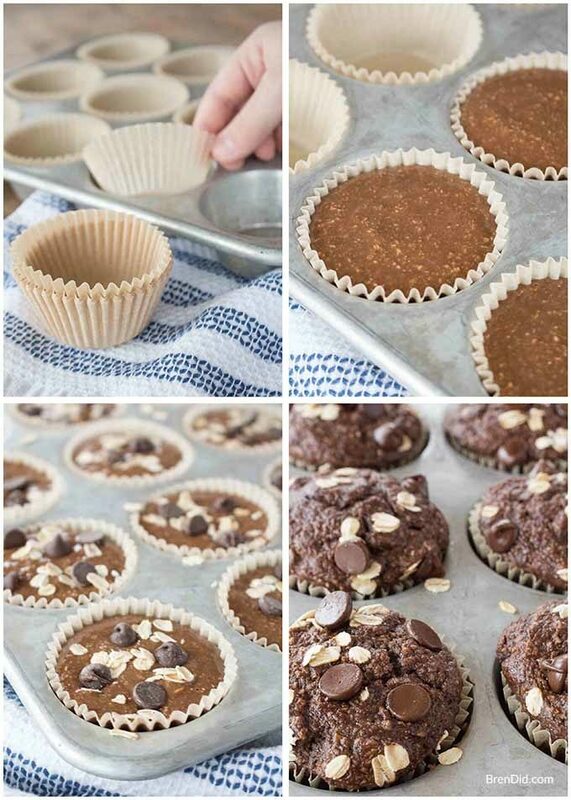 Healthy Chocolate Oatmeal Muffins are healthy enough for breakfast and decadent enough for dessert. 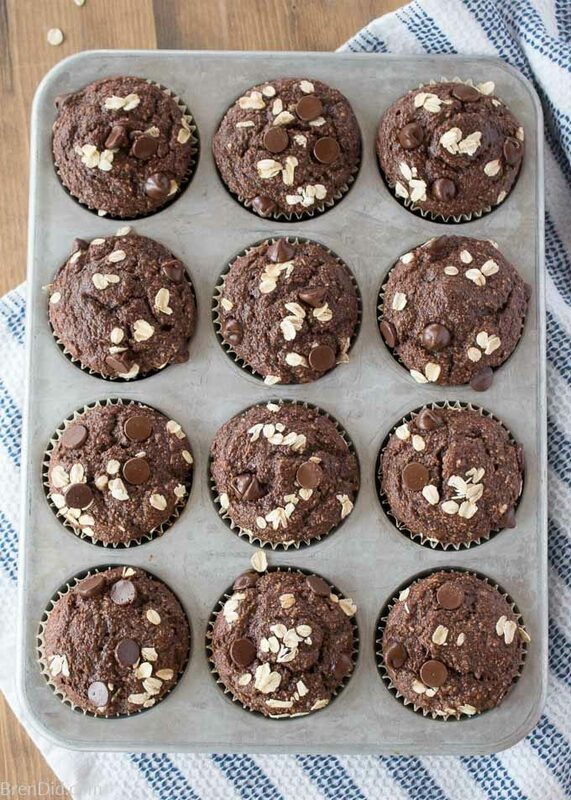 They contain no flour, no oil, and are refined sugar-free but still have the irresistible chocolatey flavor of oatmeal chocolate chip bakery muffins. My kids' all-time favorite muffins! This post uses affiliate links. They don’t cost you a thing and help us bring you tasty recipes. Read more in Policies & Disclosures. When I was pregnant with my daughter I was obsessed with double chocolate muffins. Could eat everyday obsessed. Just need to make a quick run to the bakery obsessed. See you in my dream OBSESSED. There was just one problem with my pregnancy induced chocolate chip muffin habit >> the pregnant women need-to-eat-healthier problem, and also the my-toddler-is-watching-me-eat problem. Ah, the trials of motherhood. 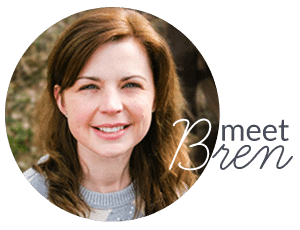 Fast forward a few years and I've used my chocolate muffin obsession to solve another trial of motherhood… packing healthy lunches my kids want to eat. We're pretty healthy eaters so packing healthy lunches is not a huge problem… until lunchtime arrives at school. My kiddos definitely get lunch box envy when their classmates pull out snack bags of chips, prepackaged cookies, soda, and candy. They come home from school full of “why can't we” questions and complaints. And I get it… homemade hummus pales in comparison to Oreos! And I love to make my kids happy… but I don't want to sacrifice healthy lunches. 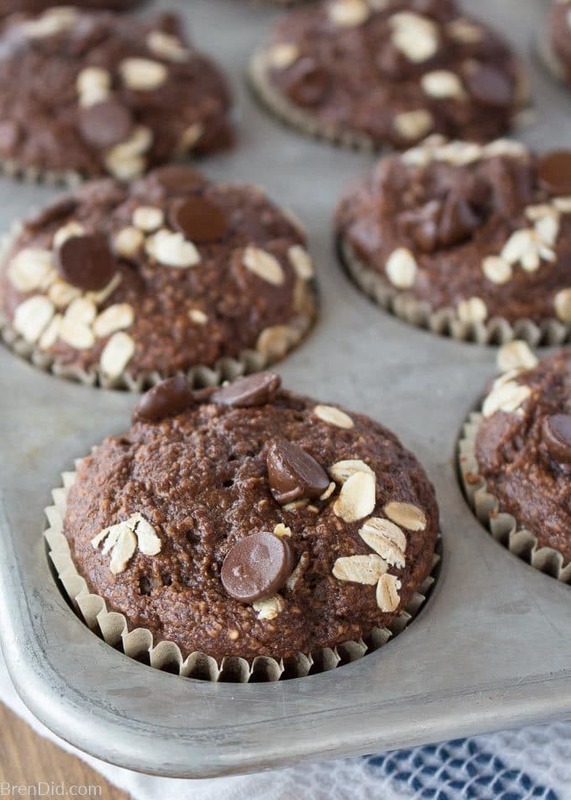 Enter healthy chocolate oatmeal muffins, the perfect solution for lunch box envy. They look delicious and tempting (hello, chocolate chips!) but they are healthy! 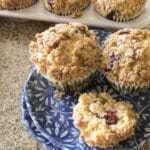 Each of my healthy oatmeal muffin recipes are made with no flour, no sugar, and no oil. While this might sound like a recipe for cardboard, it actually produces amazingly delicious muffins! 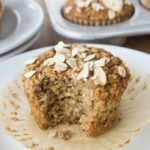 Toasted oatmeal replaces flour (use gluten-free oats for gluten-free muffins) for a smooth muffin with a slightly nutty favor. Bananas are used instead of oil or butter to produces tender, moist muffins. Honey replaces refined sugar to add just a touch of sweetness. 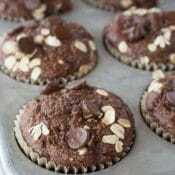 Unsweetened cocoa and chocolate chips make the healthy chocolate oatmeal muffins CHOCO-rific. These home baked treats rival the huge chocolate chocolate chip muffins in bakeries and coffee shops… with a fraction of the sugar and calories. With or Without Chocolate Chips? I'm 100% pro chocolate chip, but the decision is up to you! 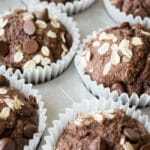 The chocolate oatmeal muffins are delicious with or without chocolate chips. I stir 1/2 cup of chocolate chips into the batter and press the remaining ½ cup onto the top of the muffin batter before baking to produce a super tempting display of chocolate on top of each muffin. To keep the muffins extra healthy I buy chocolate chips that use as few ingredients as possible. My favorites are Trader Joe's semi-sweet chocolate chips and Enjoy Life chocolate chips, both are made with three limited ingredients: cane juice, chocolate liquor, and non-dairy cocoa butter. If you’ve never tried these delicious chocolate chips you are missing out! They are much tastier than most chocolate chip brands. You may omit the chocolate chips altogether or use dried fruit, nuts, or fresh fruit instead. Limit your mix-ins to 1/2 cup per batch for best results. Place 1.5 cups of the oats in a food processor and blend/pulse until they reach a rough, flour like consistency. Mash bananas well, they should have no lumps. Add eggs, honey, milk and vanilla. Mix to combine. 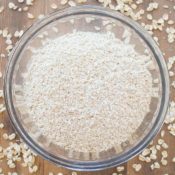 Add dry ingredients (including both 1.5 cup ground oats and 1 cup unground oats) to wet ingredients and mix until just incorporated. Allow batter to sit for 10-15 minutes to soften the oats. Fold in approximately 1/2 cup chocolate chips (if desired). Sprinkle muffin tops with reserved oats and remaining 1/2 cup chocolate chips, press down lightly. Healthy muffins are more dense than typical muffins. These tips will help you get the best results. Press lightly on the top of a muffin when checking for doneness. It should spring back. If the muffin top stays indented or feels mushy the center is probably underbaked. 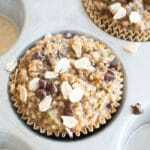 1 – Healthy Oatmeal Muffins – My original recipe is sweetened with bananas, no flour and no oil. 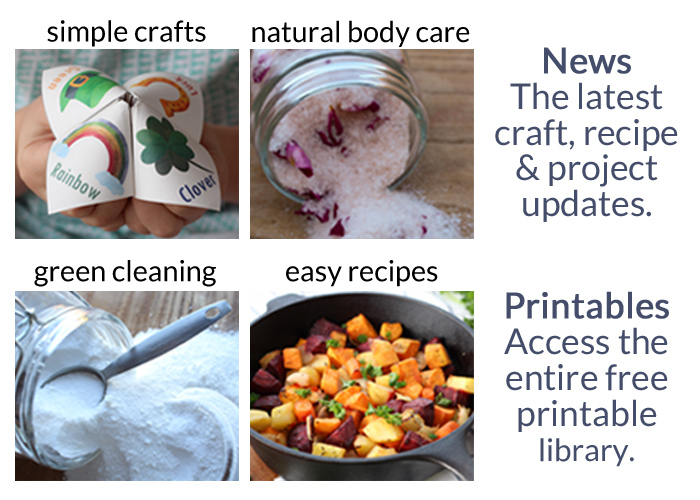 Easy to customize with your favorite add ins. 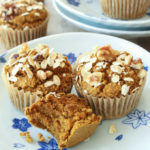 2 – Healthy Pumpkin Muffins Recipe – Delicious pumpkin spice flavor, no oil, no gluten and dairy free. They taste like pumpkin pie. 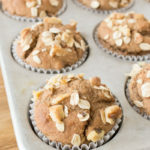 3 – Apple Cinnamon Blender Muffins – This easy recipe mixes in the blender for no mess but delicious cinnamon apple flavor. Still no flour, no sugar and no oil. 4 – Healthy Zucchini Muffins Recipe – Zucchini and spices give these muffins classic zucchini bread flavor. A fall favorites with no guilt. 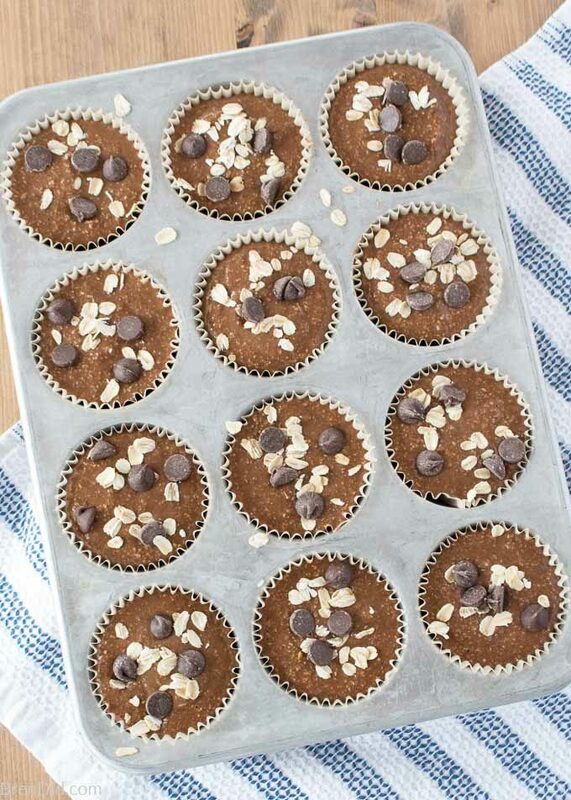 5 – Healthy Chocolate Peanut Butter Muffins Recipe – These muffins are full of chocolate peanut butter flavor. Classic flavor combo that is better for you. Place 1.5 cups of oats in a food processor and blend/pulse until they reach a rough, flour like consistency. Add dry ingredients (including both ground and whole oats) to wet ingredients and mix until just incorporated. Allow these to sit for 10 minutes to soak the oats. Fold in approximately 1/2 cup chocolate chips, if using. Scoop into muffin tin, lined with muffin wrappers (makes 14 muffins). You can spray the bottom of the liners lightly with spray oil to make the muffins easier to remove from the wrappers. Can't get enough healthy chocolate baked goods? 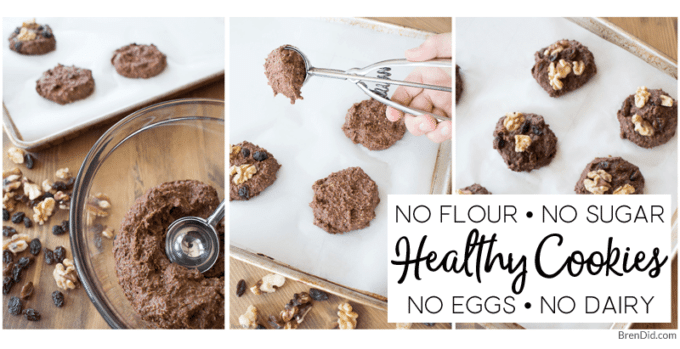 Check out these healthy cookies . My kids love them for breakfast! Like my healthy recipes? Sign up for my free newsletter below and never miss another recipe. I have made these muffins 2 weekends in a row, they are unbelievably delicious given the healthy ingredients! These will be in heavy rotation in my meal prep moving forward. Thanks! I’m so glad they were a hit, Kelly! I just made a batch and they turned out amazing! I used dates and lessened the honey. Just the right amount of sweetness. Thank you for sharing this recipe. Mona, I’m so glad you enjoyed the muffins! Can i use cacao powder instead of cocoa? Zehrha, I’ve never made the recipe with cacao powder so I’m not sure how well it would work. Let me know if you try! I haven’t tried these yet but curious if almond, cashew, or oat milk would work in this recipe? Yes, you can use any type of milk you desire. I made these today. I didn’t have quite a cup of banana so added a bit of apple sauce. I like that it is just oatmeal in it. I bake with flour all of the time, so it’s nice to change it up. They are delicious. Thank you for posting. I’m so glad you enjoyed the muffins, Patti! I ca’t wait to try these, thanks for all the tips on different substitutions!! Thank you so much!! !